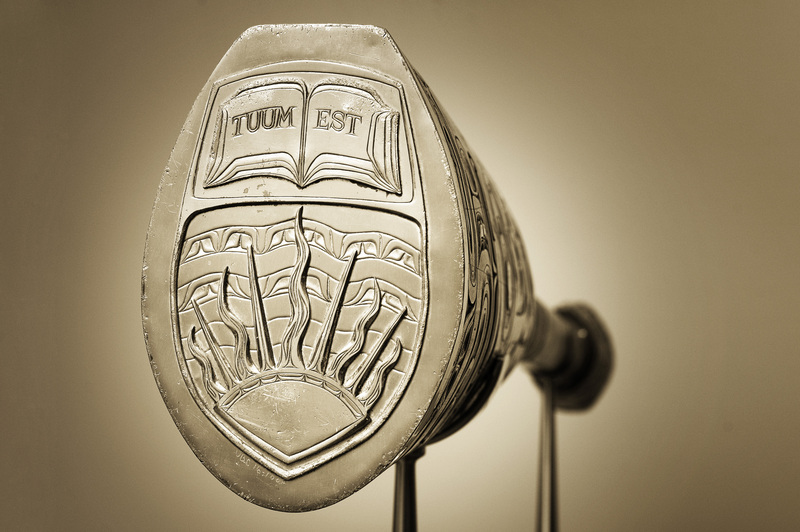 The University Mace is a symbol of the authority of the Chancellor. It is displayed on ceremonial occasions, most notably during the congregation ceremonies but also during the Installation of a President or Chancellor. In the fall of 1957, the University commissioned Haida carver Bill Reid to undertake the project. Owing to Reid’s heavy workload, he suggested that George Norris be asked to help design and carve the Mace. The planning of the Mace took some time and a final design was not approved until 1959. Norris carved the Mace from a block of yew and it included a stylized thunderbird on the thick upper portion. The Mace also featured the use of copper that is prominent in Northwest Coast native art. This copper trimming was designed and prepared by Bill Reid. Norris completed the Mace in 1959 and it was first used at the Fall Congregation where the Director of Ceremonies, Malcolm McGregor, carried it for the first time. Today the Mace is carried by the ‘Macebearer’ who leads the Platform Party, which includes the Chancellor, the President, and other dignitaries, onto the stage for the Congregation ceremonies.